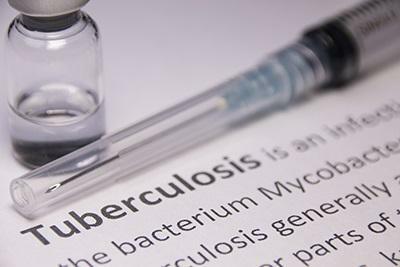 April 6, 2018 — A new blood test has been found to more accurately predict the development of tuberculosis up to two years before its onset in people living with someone with active TB, according to research published online in the American Journal of Respiratory and Critical Care Medicine, an American Thoracic Society journal. Those living with someone with active TB are at highest risk for developing the disease, yet only about 5-20 percent of people infected with tuberculosis actually develop TB. A blood test that predicts the development of TB without putting large numbers of lower-risk people through unnecessary preventative treatment is not currently available. In "Four-gene Pan-African Blood Signature Predicts Progression to Tuberculosis," researchers from an international research consortium report that they developed and validated a blood test that measures the expression levels of four genes that can more accurately predict the development of TB in high-risk patients in Sub-Saharan Africa. "We found that this prediction [up to two years before the onset of the disease] is possible through measurements of a combination of a four-gene signature in the blood," said Professor Gerhard Walzl, MMed, PhD, lead study author and leader of the Stellenbosch University Immunology Research Group, Tygerberg, South Africa. "This signature, known as 'RISK4,' was found to be present in all cohorts in the study, from South Africa, Gambia and Ethiopia." RISK4 is a combination of four genes associated with inflammatory responses. For quality control, the scientists used a training-test set approach: they divided the sample data up in a discovery (training) set on which the signature was developed and then tested the signature on the remainder of the samples (test set) in a blinded manner. Although blood samples from individuals in Uganda were initially included in the study design, they were not available in large enough quantities to be properly analyzed. Focusing on people who lived with someone with active TB, the research team enrolled 4,466 HIV-negative, healthy study participants from the households of 1,098 index cases (people with active TB, who allowed the researchers to enroll members of their household who did not have TB in its active stage). Blood samples were taken from the 4,466 study participants, and stored. At the end of the initial study period, when it was apparent who had progressed to TB and who hadn't, the blood samples of 79 individuals who progressed to active TB between 3 and 24 months following exposure, and 328 who remained healthy during the 2 years of follow up, were analyzed. (Due to the cost of the tests, the blood samples of the other study participants were not tested.) Various biosignatures – combinations of gene or protein levels that together result in a test readout that relates to current or future risk for developing the condition – were measured. "The individual components of this signature may not be sufficient to deliver an accurate diagnosis of prediction, but a combination of these markers improves its accuracy," said Prof. Walzl. A number of companies have the ability to develop tests that measure the presence of these four genes. "We are hoping that primary health clinics will be able to use such a test and the reagents would then be readily available in that format, similar to the tests that are currently used to diagnose TB," added Prof. Walzl. While there are currently tests on the market that may predict progression to TB, the test developed by Prof. Walzl and colleagues gives positive results for a smaller percentage of high-risk household contacts than the current tests. This translates to fewer people being treated unnecessarily in order to prevent TB. "Preventative treatment is several weeks long and has potential side effects," explained Prof. Walzl. "One wants to limit the number of people who have to undergo such treatment to those most likely to be at risk for developing active TB." Tuberculosis, caused by infection with Myobacterium tuberculosis (M.tb), is the world's leading cause of death brought on by a single pathogen. More than 10 million new cases of TB are diagnosed each year, and almost two million people die from the disease. Globally, 1.7 billion people are estimated to be infected with M.tb. "This study is the first step, and now the impact of this test on prevention of TB will have to be tested in multicenter clinical trials," Prof. Walzl stated. "In addition, the validity of the prediction in high-risk individuals in Asia, South America and other high-priority areas needs to be assessed."